You know what it’s like to be told how lucky you are to be someone’s prisoner? Well, Theon, as you should know better than anyone, there’s being a prisoner and being a prisoner! But either way, with the AvA phase behind us, it is time once again to turn to the numbers to help make sense of the fighting. We will start with the regional VP growth, showing the regional standings of the top twenty Alliances in terms of overall VP. In The North and Iron Islands, we admit taking some pleasure watching the mega battle between Shagga Likes Axes and Kong’s Landing. Was it something about a Salty Rat Cook title that made them draw their swords with such vengeance? Or was this simply personal? Likewise, it was exciting for us to watch the day-by-day melee in The Vale among the half a dozen or so Alliances fighting to beat Harambe’s Revenge for the Rank One Title. While Harambe’s Revenge never fell from top rank, the second rank title was up for grabs for most of the phase. So, we tip our helm to the Original Protectors of the Realm, Kings of Winter, Valyria and Murder of Crows for a fight well fought! As always, Helpful and Harmful actions tell the story of Alliance to Alliance actions, independent of time and region. The tables serve to illustrate where the battles raged most fiercely and the help flowed most freely. In a previous phase, you might recall our musing about what these numbers might look like over time. Clearly, our Data Maesters have started reading the forums, because they offered the following sample graph of what harmful actions over time would look like. As with all graphs over time, this one hints at a story. 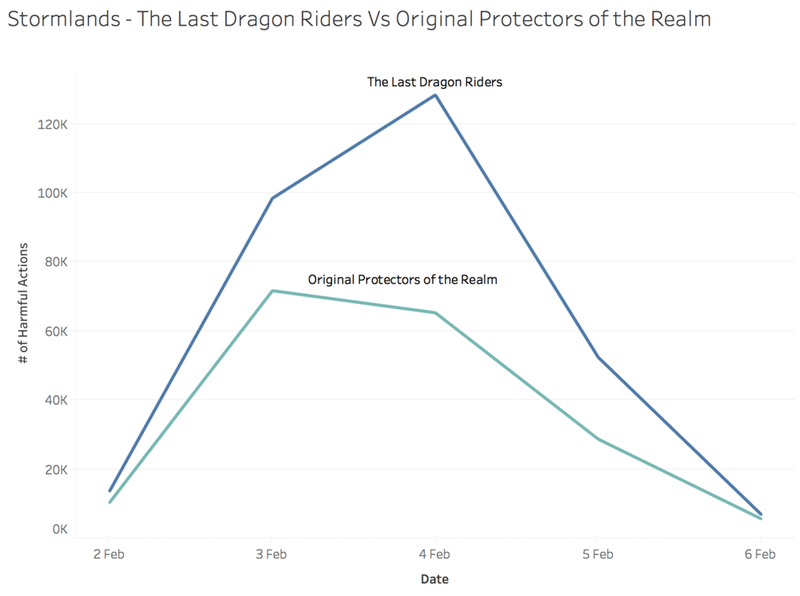 In this case, the fight for supremacy in Stormlands where ultimately The Last Dragon Riders conquered Original Protectors of the Realm to achieve First and Second Rank titles respectively. To close out this blog, we want shine a little honor on a pair of Alliances who, like so many across Westeros, battled hard throughout the phase. If you were in Riverlands, you might have seen Dragons of Summerhall competing with House of Rebirth to achieve the highest number of Aid Actions. While Dragons of Summerhall ultimately earned the title, it was anyone’s win nearly to the last day. 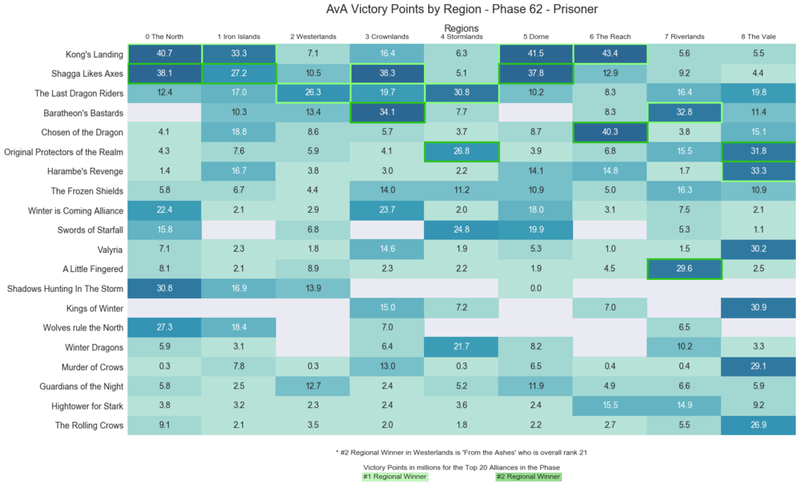 Congratulations to all Alliances who participated in Prisoner. Consider yourself not so much freed as free to fight again. See you all next week for the Fugitive Phase.